Ultimate Ears is expanding its portable wireless speaker lineup which up until today was only made up from a single offering, the incredible UE Boom speaker. A year ago Logitech introduced the UE Mobile Boombox under a joined Logitech UE brand which still exists today, however, Ultimate Ears is now coming out with its own near-identical version dubbed the UE MINI BOOM. The $100 mini wireless Bluetooth speaker boasts a number of enhancements over its UE Mobile Boombox predecessor - namely wireless dual-speaker mode funtionality we've seen first introduced with the UE Boom, but carries with it the same familiar svelte rubberized design. What makes the UE MINI BOOM a better speaker than its predecessor, or more importantly, should you invest in two for the price of a single UE Boom speaker in order to create a more affordable wireless dual speaker setup? Let's find out! Apart from a new metal speaker grille pattern to differentiate the new Ultimate Ears-branded model to Logitech's UE Mobile Boombox, the two share an identical form factor, design, materials and even the same build quality which we're lightly bummed out about since we were hoping that Logitech would pay more attention to how it glues together that rubber cladding onto the speaker unit. But more on that later. The UE MINI BOOM's sound signature hasn't seen any tweaks that we can pick up compared to the previous model, but it is noticeably louder this time around though not nearly as powerful as the UE Boom. 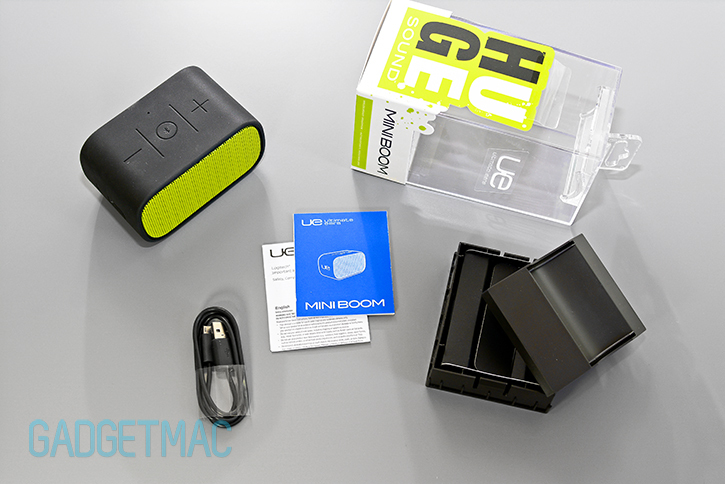 Internally, the UE MINI BOOM's hardware remains relatively unchanged compared to the UE Mobile Boombox, but now features an NFC chip like its bigger brother the UE Boom. Available in exactly the same red, green and black colors as before with a few new additions such as more outlandish purple and orange schemes, the UE MINI BOOM is half the price of Ultimate Ears' flagship UE Boom at $100. And because of that, it can be said that the UE MINI BOOM's audio performance is half of that of the UE Boom's. Granted it's more compact and obviously the more affordable option out of the two. Now that Ultimate Ears has created a booming and trendy speaker branding, it looks like the Logitech UE branding will slowly fade back to its respective owner. Logitech has a track record for confusing consumers with its indecisive branding and product naming decisions. But now that Ultimate Ears regains control of its own destiny, our expectations for more awesome products like the UE Boom is higher than ever. Both the Logitech UE and Ultimate Ears brands are all about being cool and trendy, and you can see that in the Jawbone-esque packaging displaying the UE MINI BOOM behind a museum-like showcase in a rebellious slanted pose saving you the thrill of your unboxing ritual. This works, because we like that very much. And the best thing about this packaging is that it's easy to open and once you're in, the included accessories are neatly packed inside in a modular fashion. Inside you will find a short USB to micro-USB charging cable along with a tiny user's manual. 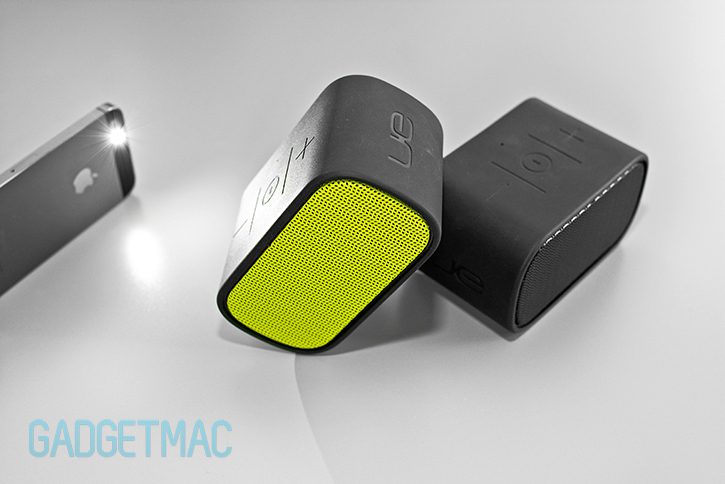 What's missing is the USB wall adapter which is included with the Logitech's UE Mobile Boombox model. The UE MINI BOOM is the sort of gadget that will grab you focus even though you never thought about the likes of a wireless portable speaker. Design wise, Ultimate Ears' UE MINI BOOM speaker is arguably the best looking portable speaker of its stature. Sitting right beside it is notably Jawbone's designer designed mini Jambox. The two make for an unstoppable power of sexiness. But only one ranks on top. The UE MINI BOOM is a simplistic portable speaker yet highly modern in its design using smooth, rounded-off rubber exterior sandwiched between two metal speaker grilles. It should have been called the UE MINI BOOMBASTIC, that would have been fantastic. Size is really not an issue when it comes to portability. The UE MINI BOOM is shorter than your average iPhone 5s/5c making it as insanely portable. It measures 4.4 x 2.6 x 2.4-inches (or 11.1 x 6.7 x 6.1-cm) and weighs 1.32 lb (0.6 kg). It isn't terribly small nor a big portable speaker compared to others. Those rounded corners make it seem even more compact. The UE MINI BOOM is pretty basic when it comes to controls. It features over-sized integrated volume up and down buttons at the top that are hard to make out in the dark, flanked by a multi-function Bluetooth pairing button dead center. With the middle multi-function button you can only use to pair with other devices as well as to answer and end a call. Unfortunately, there aren't any on-board mute, play/pause and skip track controls on the UE Mini Boom. There's also a built-in mic located near the buttons on the top which enables you to use the UE MINI BOOM as a wireless speakerphone; and it works extremely well. Our caller on the other end heard us loud and clear even while we were talking from as far as 5-feet away. It picks up voice surprisingly well. So as a speakerphone, the UE MINI BOOM is impressively great. When first powering on the speaker, a welcoming guitar strumming sound will play on startup similar to the Jambox's startup chime. The same guitar strumming chimes are heard for various different statuses the speaker has and it makes for a pleasant user experience. A small ultraviolet LED light hidden just above the front speaker grille will blink and transfer to solid when a connection is made, but will turn off after around a minute or so even when the speaker is on and working. The speaker will automatically go to sleep if its not active and can instantly wake up when it senses audio streaming from your device. Around the back of the UE MINI BOOM is where you will find the wide passive radiator opening for air flow, power switch, micro-USB charging port and a 3.5mm audio input port for use with devices that have no Bluetooth support. Usually when a wireless speaker features a 3.5mm input, it also comes with an audio cable in the box, however, the Mobile Boombox doesn't include one. Pairing the UE MINI BOOM is a quick, effortless and can be done in two different ways. The UE MINI BOOM supports A2DP and HFP 1.5 Bluetooth audio streaming and speakerphone profiles. That means you can pair two devices at once or up to 8 different devices which the UE MINI BOOM will memorize and will quickly connect to. Also, there's no lag between video and audio playback when paired over Bluetooth so you can watch movies, videos and play games as if you were hardwired. Unlike Logitech's UE Mobile Boombox, you can also pair the UE MINI BOOM with an NFC-enabled device using the universally adapted tap-to-pair method. Battery life has been terrific nearing the claimed 10-hours of battery life with constant Bluetooth streaming. Granted it isn't as mind-blowing as the UE Boom's 15-hour battery life, however, for such a compact speaker I don't think Ultimate Ears could have done any better. The built-in rechargeable battery can be recharged on the go over USB using your laptop or even an external battery pack with enough juice or by directly plugging it into a wall socket. The underlined feature though is the UE MINI BOOM's dual speaker mode which with the help of the iOS and Android-compatible free UE app, can link two speaker units to your iPhone, iPod touch, iPad or Android device to wirelessly stream music and audio creating either a stereo or doubled sound experience between two individual speakers. We were sent two UE MINI BOOM speakers for the sole purpose of testing out Ultimate Ears' wireless dual speaker pairing technology, and you can color us impressed by it. If you're willing to put down $200 in exchange for two UE MINI BOOM speakers, we think you'll be surprised by how versatile and powerful such small speakers can turn out. The audio experience is exhilarating when using two speakers simultaneously in a surround sound setup. But not only that, you can place one speaker at one end of the room with the second one placed the opposite end to create a full, spacious audio experience that engulfs you with sound from opposite directions. With such a lengthy wireless Bluetooth range, you can even separate the two UE MINI BOOM speakers into different rooms or living spaces so your music beautifully spreads around as if you've spent hundreds if not thousands of dollars on a home speaker system and installation. Well, that's a bit of an exaggeration but you get the point. And the fact that Logitech made this whole thing possible with such effortless user experience really makes us impressed and thoroughly happy with such an amazing result. Speaking of Bluetooth range, Ultimate Ears claims that the UE MINI BOOM has a Bluetooth wireless range of 50 feet. But in our testing we could only reach around 30 feet until the audio would start to drop out. If you live in an apartment though, the reach is enough to enable you to set the speakers in different rooms across your home. The UE MINI BOOM app is as well designed as it is easy to use. 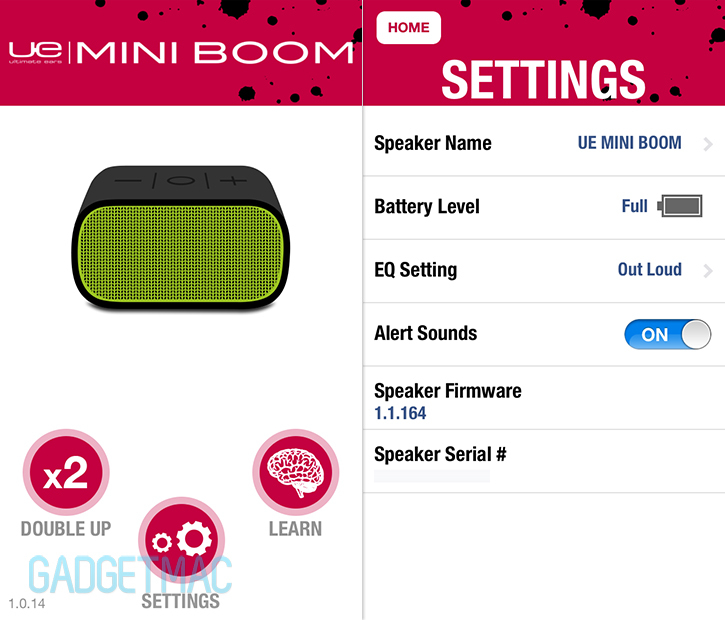 Firing it up once you've paired your UE MINI BOOM with your device will display the correct model and color of your personal speaker as well as the remaining battery life, firmware, serial number and a user guide on how to use the speaker itself. The app lets you adjust the EQ, but we found that there isn't a noticeable difference between each setting. There's of course the "Double Up" option which takes you to a pairing screen where you can join a secondary UE MINI BOOM or even a UE Boom speaker to create a dual wireless streaming setup. Stereo mode assigns a left and a right speaker for better sound separation, while double mode simply streams your audio to both speakers simultaneously which is ideal when separating the two speakers into different rooms. If you already own a UE Boom and are thinking about getting the UE MINI BOOM as a secondary speaker, it's important to mention that you won't be able to link the two in stereo mode. Although Ultimate Ears has made pairing two speakers to one audio source a painless and effortless process that's controlled by a user-friendly app interface, there is one small detail that has been left out. Each time you want to wireless stream using two speakers in dual mode, you'll need to open up the app and initiate dual mode which will require re-paring the secondary speaker with the app. The process is fairly quick, but it's unfortunate that there isn't a dedicated solution for dual mode Bluetooth pairing that would set the speakers to always stay in dual mode with your Bluetooth device. There's no audio lag between the two speakers and both are synced brilliantly, however, you'll only be able to control the volume of both speakers using your audio source since adjusting the volume on one of the two speakers doesn't affect the other which depending on your speaker arrangement, can be a great plus. The build quality at first seemed to be very promising. The UE MINI BOOM is a rounded block that's weighty and sturdy enough to be called solid with front and back metal speaker grille covers. The body itself is constructed out of plastic and is surrounded by this endless black rubberized layer that not only adds durability and self protection against the occasional drop and tumble, but also provides an ample amount of traction that keeps the speaker in its place even when playing music at the highest sound level. The top of the speaker also provides a nice and safe spot to place your smartphone on when playing music, and it's also where you'd tap your phone for NFC pairing. Apparently the entire rubber layer surrounding the speaker is held on using adhesive that's clearly not up to the job holding on to the hard plastic and rubber materials together resulting in mild separation if grabbed by the edges. After picking up the Mobile Boombox numerous times near the top edges where the rubber overlaps the metal grille, we started to notice that in some parts the adhesive is weaker or that there isn't enough of it to keep a strong bond with the two materials. We really thought that Ultimate Ears would learn by now since the Logitech UE Mobile Boombox was released with the same exact issue, alas it seems that the build quality has not changed one bit in the newer model. While we're not sure how well the UE MINI BOOM will hold with heavy use, being tossed inside your bag or just handed over to friends, the rubber around the speaker doesn't seem like it would start to peel all on its own. But beware, the UE MINI BOOM isn't as durable as its taller stablemate. Like we've said in numerous past reviewed of such small devices, it may be small, but it sure does pack a loud punch. Like the UE Mobile Boombox, the UE MINI BOOM's two 1" "full-range" drivers are powerful enough to fill a small apartment with sound. As much as I'd like to call it immersive, the sound isn't even separated by a stereo sensation, unless of course you're using two of these little rubbery munchkins, which just results in a what you would have thought the sound would sound like coming from it; compact and one directional. The sound signature of the UE MINI BOOM closely resembles that of Jawbone's Jambox in that it sounds very warm with a held back midrange and not so sparkly highs. However, in our testing the Jambox sounded the least appealing against the UE MINI BOOM, JBL Flip, Charge and of course the UE Boom. Mids on the Mobile Boombox sound dark and on the recessed side. Where the UE MINI BOOM performs best is in the lows and highs. Highs are acceptably clear and defined while the bass tones are surprisingly good and present without having great impact on the rest of the spectrum thanks to the 3" passive radiator that sits in between the two drivers. The sound does not distort at high volumes which is superb considering the tightly packed form factor and small drivers. Details aside, the UE MINI BOOM does sound good for the $100 price point and actually beats some of the much pricier portable speakers out there like the Jabra Solemate. As mentioned earlier, the UE MINI BOOM is noticeably louder than the UE Mobile Boombox at 86dB compared to 78dB which is a welcome little improvement, but it still lacks the ear-popping power of the UE Boom. There's good reason why the UE MINI BOOM costs $100 and has the word mini attached to its name, and that's because Ultimate Ears' $200 UE Boom is twice as good in every regard. But if you can't justify spending $200 on a wireless speaker, the UE MINI BOOM is a fantastic little alternative that can be paired up with a second one like it without costing more than a single UE Boom speaker. 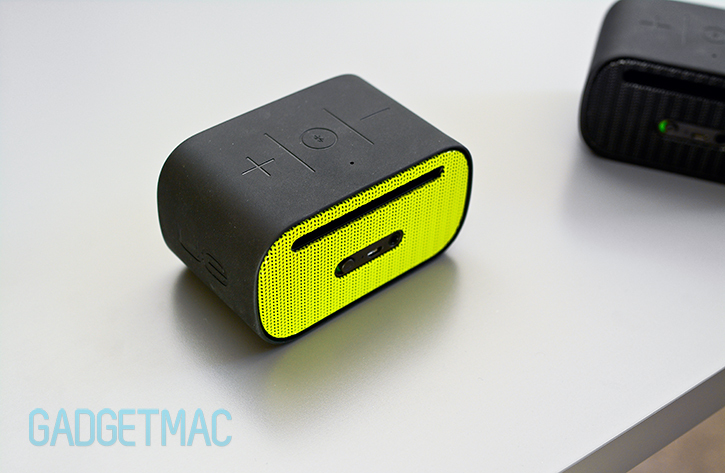 And for that you get really big sound and great battery life which is vital for every portable wireless speaker. Even though the sound quality doesn't live up to a high-end speaker system, Logitech's wireless dual speaker technology makes up for it with effortless and spacious audio experience that can be set up around the home in seconds. As mentioned in our UE Mobile Boombox review, the UE MINI BOOM's identical build quality needs more toughening up and still doesn't match the durability of Ultimate Ears' UE Boom. As much as we like the gummy design and the way it performs, the UE MINI BOOM is potentially a risky $100 investment and that's a shame because otherwise it's a nifty little Bluetooth speaker. That being said, the UE MINI BOOM deserves a slightly better overall rating compared to its predecessor. Ultimate Ears has improved its loudness, added NFC pairing, and a wireless dual-mode feature which we think is impressive enough to merit a recommendation. If you like the idea of having two separate wireless portable speakers but you aren't crazy enough to spend $400 on two UE Boom speakers, we think the UE MINI BOOM offers acceptable performance at a reasonable cost with two units will cost as much as one UE Boom speaker. What if you happen to have a spendy UE Boom kind of budget and you're looking for the absolute best portable wireless speaker with epic rich sound? Then have a look at the Bose SoundLink Mini and how it stacks up against the mighty UE Boom. The "mini" moniker is making big rounds in the wireless speaker market.